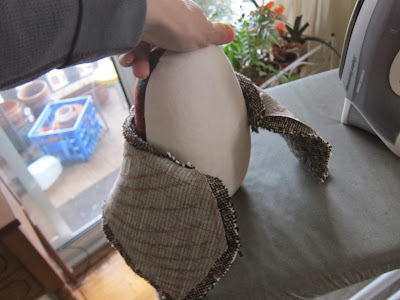 Today I worked primarily on the undercollar and undercollar stand (two separate pieces) of my peacoat. I'm reluctant to offer anything that feels like a tutorial since I'm doing most of this for the first time. 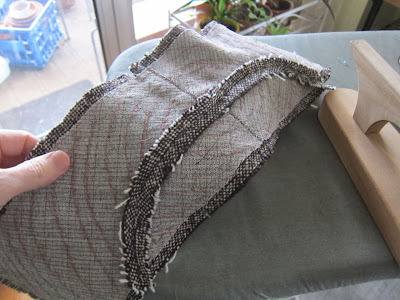 I have many tailoring books outlining the steps for interfacing with hair canvas and they're all a little bit different, so I'm just relying on my common sense and doing what works for me. I'll be able to judge my choices when the coat is finished and, over time, when I see how it wears. Hair canvas seems like the best bet for interfacing a heavy fabric like my tweed, but, after reading Paco Peralta's coat sew-along from a few years ago, I also decided to fuse a super-thin knit interfacing to my overcollar, the inward-facing collar stand, and the front facings, to stabilize them. My tweed isn't as loose as bouclé, but it is stretchy. 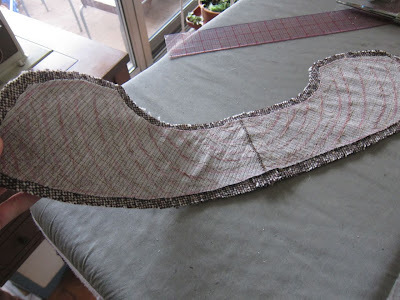 Pad stitching isn't hard once you understand what you're trying to accomplish -- to attach the hair canvas to your fashion fabric so that they work as one, and to help shape the collar. Since you don't want hair canvas in your seam allowances, you have to make sure you don't stitch into them. (You can stitch close though.) 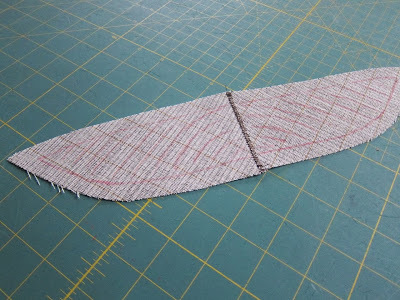 When you're done stitching you can trim the hair canvas out of the seam allowance area. 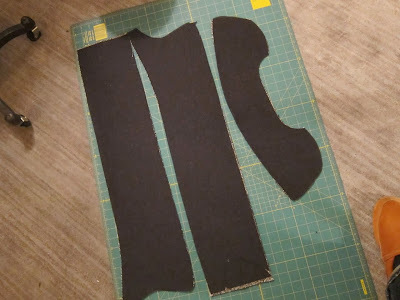 Before I started any of this however, I trimmed my undercollar along the outer edges so that it would be roughly 1/4" smaller than my overcollar. You don't want the undercollar peeking out from under the overcollar when you've turned and topstitched them. 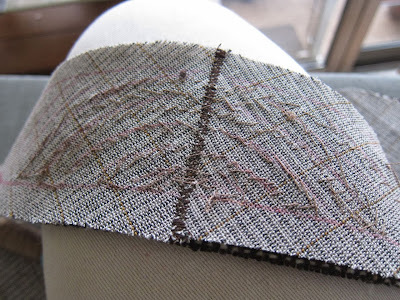 After seaming my hair canvas with a lapped zigzagged seam, I drew the approximate lines of my pad stitching (and the seam allowances) with a colored pencil. When I was done with both the undercollar and the collar stand, I attached them to each other, pressed the seam allowances open, trimmed where necessary, and then from the right side topstitched them down at 1/4" from the seam, a detail that's in my peacoat instructions. I could also have whip stitched the seam allowances down on the wrong side. 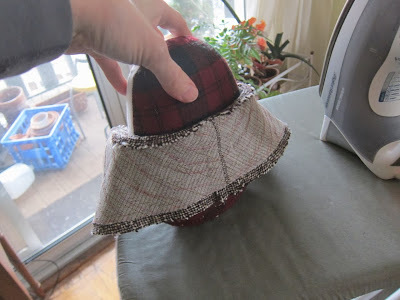 Finally, I folded the collar and stand around my tailor's ham and steamed them to shape them. I propped the ham up with the collar pinned to it to allow the wool and hair canvas to dry overnight. The decision to fuse my facings and over collar was one I made only today. 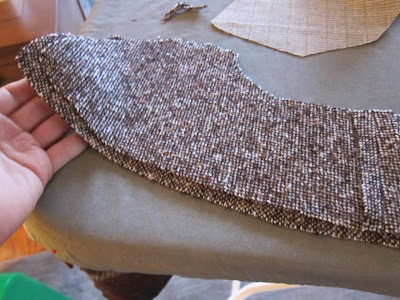 First, I tested the lightweight knit on my tweed and I liked the result: the wool looked and felt the same, but was less prone to stretching. 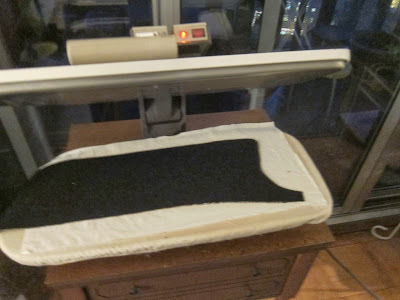 Then, I cut my fusible knit and bonded it to my fashion fabric with the aid of my Elna Press. I left the fusible knit in the seam allowances; it's so thin that it won't add bulk. Tomorrow I hope to interface my coat fronts with hair canvas. I don't think I'll be pad stitching my lapels since I want them to be flexible and easy to turn up but maybe I'll change my mind. (Same goes for taping the lapel roll line with twill tape: this is not like a suit jacket whose lapel you want to stay fixed in place.) More research needed. I'm hoping to be able to do the "turn of the cloth" on Wednesday if everything goes well. And that's it. I'm trying to just take it a step at time and keep the stakes low. My priority is to learn as much as I can and make the best coat I can right now. 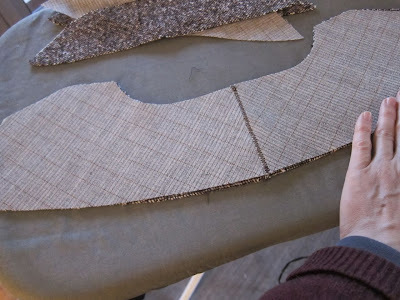 Gertie's Lady Grey Sew Along is another great resource for step-by-step instructions on tailoring a coat. I used her posts to sew my Lady Grey last year and a second coat this year. I highly recommend it. The posts start around October of 2010. Love that you're showing your Elna Press some love! Hi Peter - nice to see your work in progress. Could you tell me a bit more about your pad stitching? What did you do to determine direction and stitch length? Does it show on the other side - the outside? Thanks! My stitches radiate out in (very approximate) concentric rings from the center seam. The stitches are tiny and do not show through at all. They're maybe 1/8" on top. The stitches are denser in areas I want more rigid and looser elsewhere. So, for example, the outside edges of the undercollar have more dense stitches as does the undercollar stand, Most sewing books explain how to pad stitch and I just looked at a few diagrams and tried to imitate what I saw. Thanks - very nicely done. Looking forward to your progress. For detailed instructions, look at Von Nordheim's Vintage Couture Tailoring and the Classic Jacket tailoring book. Those have the best explanation of how to pad stitch of the books I own. It's not a simple diagonal stitch -- a regular diagonal stitch has a big horizontal thread bar on the under side. 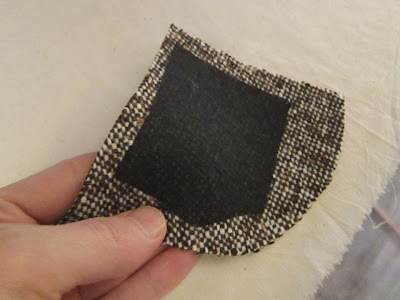 A pad stitch is supposed to be virtually invisible on the wrong side. "My priority is to learn as much as I can and make the best coat I can right now". That is the most inspiring line I've ever read on a sewing blog. Thanks, Peter! Thanks for all of the useful info and photos. I'd never seen an Elna press and now I'm totally jealous. Can you find them online? The hardest part of pad stitching for me was figuring out how to pick up only one or two threads on the outside of the fabric so it would be virtually invisible. Thomas Von Nordheim's Vintage Tailoring is excellent on pad stitching. I also like the Classic Jacket tailoring book. Cabrera says not to mark the lines. But a beginner ordinarily will get better results by creating a guide. Cannot wait to see this completed! So far it is looking beautiful. oooh! Looks like it's going to be one really good coat! Gifts For Cathy + "Who Wears It Best?" Dip-Dye Fashion -- YEA or NAY? It's Beginning to Look a Lot Like Peacoat! Buttonhole Breakthrough + New Lining Fabric! The Urban Lumberjack Look -- YEA or NAY? My Tweed Coat Revealed -- MERRY COATMAS! Tweed Coat Selfies + New Hat! PETER SINGS -- New Year's Wishes from MPB!